Hello and welcome to my page! My name is Melissa and I love food, photography and traveling. My perfect day would be spent tasting and photographing food in some coastal town with my kids. I hope my site inspires you to travel and try new foods with your family. Tom arrived home from a 12 hour work day with his partner right behind him. Both guys were exhausted and hungry from spending the day walking through hills and searching the sky for birds. 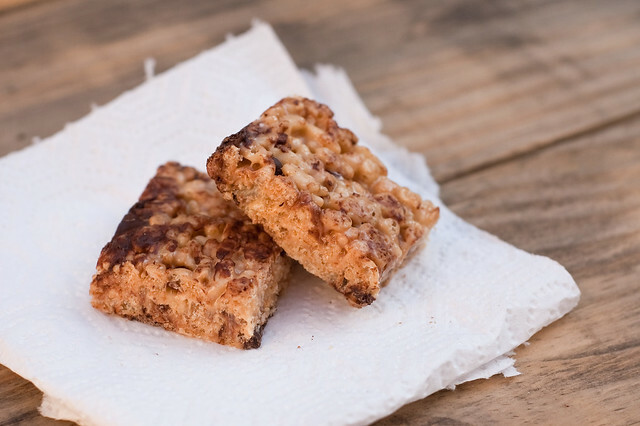 As they headed into the kitchen to clean up Tom spotted a plate of Chocolate Chip Peanut Butter Rice Treats cut into squares and left on the counter only a few minutes before. Without a thought he shoved one treat into his mouth while handing his partner a second. Crunchy peanut butter and cereal mixed with chunks of chocolate and gooey marshmallow wiped away the rumbling growls coming from his empty stomach. Before they realized what had happened the plate is nearly empty and Tom guiltily came looking for me in the living room. That settles it then. They are as good as I thought they were. I smile and settle back into my book. I am experimenting with printable recipes. The one above was designed to be printed on 5×7 photo paper and stuck in a card file, on the fridge or given to a friend. My printer ran out of ink so I wasn’t able to do a test print. Please let me know how it prints up! 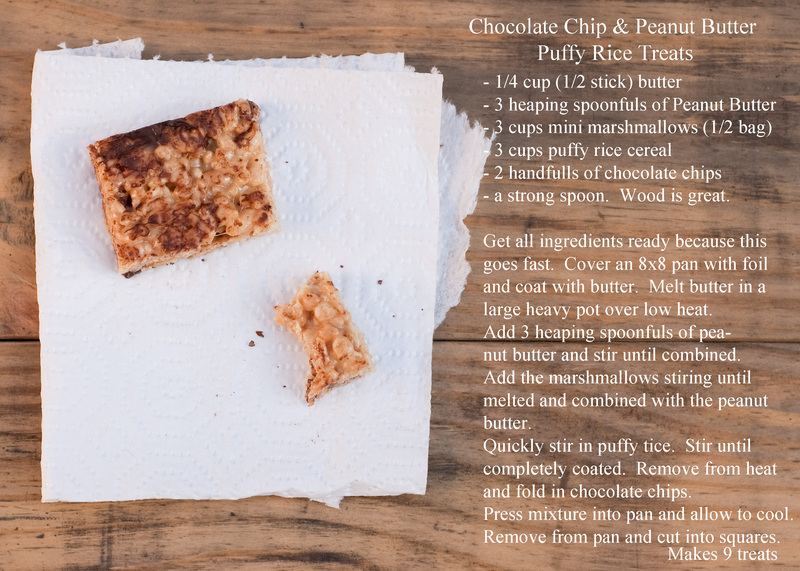 I have also written out the recipe below which you can print by clicking here. Also, don’t sell any of my images or recipe cards in any way, thank you! Get everything together beforehand because this goes fast! 1. Cover a 8×8 inch baking pan with tin foil. Coat the tin foil with butter and set aside. 2. Melt the butter on low heat in a heavy pot. When melted add the peanut butter and stir until smooth. 3. Add marshmallows and stir until completely melted and incorporated into the peanut butter. 4. Add puffy rice cereal and stir until completely covered in marshmallow. Remove from the heat and mix in 2 big handfuls of chocolate chips. Fold these in gently, but be quick about it. They will start to melt so you want to mix fast because you do not want them to melt completely. 5. When the chocolate chips are mixed in dump everything into the greased foil covered pan and press flat and into the corners. Allow to cool completely before lifting them from the pan holding the foil. Peel the foil off and cut into 9 large squares. Hide some for yourself then share and enjoy! I live in the high desert outside of Los Angeles in southern California with my 14-year-old daughter and my 6 yr old son. I love to help people, which is why I am a teacher! I find so much joy in helping others create a life they love. This little blog is about food. Growing it, cooking it and eating it! I hope it inspires you to try something new and stretch yourself! Oh wow that looks and sounds so delicious! Peanut butter, marshmallows and chocolate?? Yummm!!!! I happen to stumble upon your blog after looking for brussel sprout recipes. I am so glad that I did. These treats sound amazing! Are you a creative person? Head on over to Skillshare where you can get access to thousands of amazing classes on all sorts of skills. Start with my class on creating reusable Photoshop templates. Click here to Join me!